West Siders among those gathered at Aug. 17 protest, where Janelle Monae performed "Hell You Talmbout"
Genevea Reed-Veal, the mother of Sandra Bland, participates in a Mon. August 17 demonstration downtown with singer Janelle Monae, who performed her protest song, "Hell You Talmbout." LaRisa Lynch/Contributor. Police board meeting, Chicago Police Headquarters, 35th & Michigan Thurs., August 20th, 6:30 p.m.
Federal Plaza at Dearborn and Adams, Sat. August 29th, 12 p.m.
Every generation needs a protest song. The Civil Rights Movement had "Eyes on the Price," "We Shall Overcome" and "Ain't Gonna Let Nobody Turn Me 'Round." Now, nearly 50 years later, as young blacks and Latinos take up the challenge to end police brutality and police oppression, the BlackLivesMatter movement has its own protest song, penned by socially conscious artist Janelle Monae. On Mon. 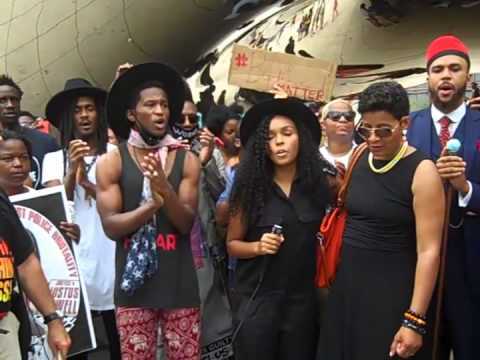 August 17, Monae and other recording artists from her Wondaland label led an interracial crowd in an a cappella rendition of "Hell You Talmbout," at an impromptu concert near Millennium Park's iconic "Bean" sculpture. The song chants the names of individuals killed by police over an Afrocentric drum beat. "What we have done is recorded a tune for you to use those who are out here on the frontlines. We believe that silence is our enemy, but sound is our weapon, music is our weapon," said the Grammy-nominated artist, who was in town for a concert at Concord Music Hall. "This song deals with the anguish, the negligence, the disrespect [and] the abuse of power — by not all police officers, but more than enough," Monae said. "We are bringing drums not guns." The impromptu concert followed a press conference to gear up for a series of national actions, including RiseUpOctober, a national day of resistance against police terror, to be held in New York City on October 24. Monday's event was co-sponsored by Stop Mass Incarceration Network, Hands Up Coalition and Stolen Lives Parents as a creative speak-out to rally artists, advocates and families of those murdered by police. "We don't come here as [an] artist, as celebrities. We come here as people. I come here as a black woman … [as] black human beings as well," she said. "We are particularly drawn to all these stories and this is the least that we can do." Among those stories with which Monae empathized was that of Sandra Bland, who died tragically in a Texas jail cell last month. Bland's mother, Geneva Reed-Veal, joined Monae front-and-center at the rally. Reed-Veal said is still pained by her daughter's death and still wants answers. "My baby is gone and we still don't know what happened to her," Reed-Veal said. "We still don't have all the information we are supposed to have, but it is gonna to be taken care off. I ask all of you with me, stay with me and those who are not with us to come with us." Rev. Gregg Greer, of the Chicago chapter of the Southern Christian Leadership Conference (SCLC), spoke at the press conference. He urged the crowd of more than 100 to do its part to stand against police brutality. "Any time there is a life lost through injustice we got to begin to come together. We got to begin to fight together; to stand together," he said. "It's not a black issue. It is not a white issue. It's a human rights issue. We have to change it." And music plays a part in that change, Greer noted. "As we begin to think about our struggle, music has always been part of that struggle. I am glad that sister [Monae] is coming because part of the movement has to be music," he said. LaToya Howell praised Monae for standing with the families. Her son, Justus Howell, 17, was shot in April by a Zion, Illinois police officer after the teen allegedly pointed a gun at him during a chase. The officer was cleared of any wrongdoing. "I felt that she showed a genuine sympathy and empathy for us. She was here. She showed up. ... That means something to us," she said. Howell hoped more artists would follow Monae's lead and be proactive in the struggle. There is power in numbers, she said. "If more of those artists and people that are in the public eye do as she did, we can gain more numbers and that's all we need," Howell said. "People need to hear us. Don't turn death ears, because it is an epidemic; it is a genocide going on whether they know it or not." "I have a newfound respect for her," added Austin resident L'Vaughn Taylor of Monae. "I always enjoyed her music, but the fact that she is taking it to a very personal [and] people like level and supporting this movement is awesome to me." After the impromptu concert the crowd took to the streets. They marched down Randolph Street blocking traffic on State Street before heading to City Hall, where they kneeled down in front of the massive building and prayed. After the prayer, they staged a die-in. South Shore resident Al-Jalil Gault, 18, an architecture student at Rensselaer Polytechnic Institute in New York, wore a black t-shirt inscribed with "I can't breathe," among the last words said by Eric Garner, who died after being placed in a chokehold by a New York City police officer. As he marched with others toward City Hall, Gault hoisted in the air a yellow placard embossed with 729, the number of individuals killed by police this year, according to the Guardians' The Counted Project. "People don't understand what institutional racism means and people don't understand what these numbers mean. But they are real, and they affect people on an everyday basis. I'm one of them," said Gault.